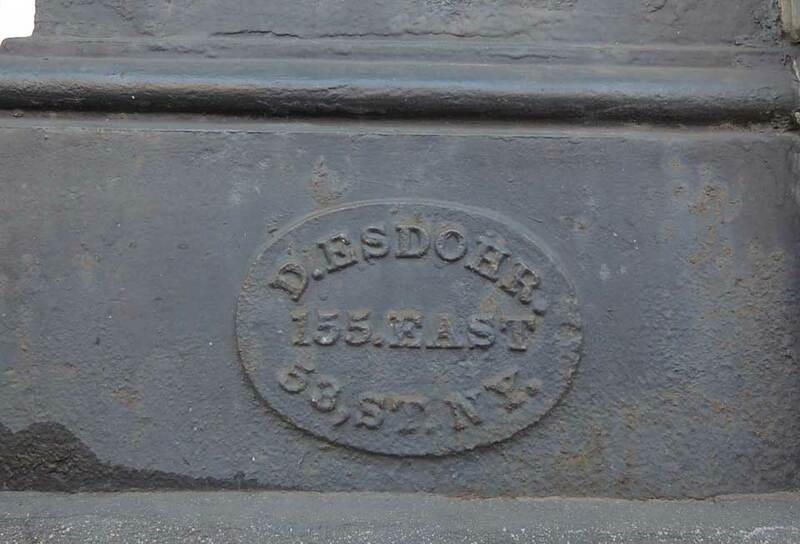 D. Esdohr is listed as both Dederick Esdohr and John D. Esdohr in city directories from 1873 to 1903. The foundry was located at 155 E. 53rd St. from 1875 to 1881. John D. Esdohr, iron railing manufacturer, lived at 893 3rd Ave., New York City, in the 1880 U. S. Census. He was 42 years old, born Bremen [Germany]. He had one daughter age 16 also born in Bremen, and another daughter age 12 born in New York. This should mean he immigrated some time between 1864 and 1868. Esdohr's widow, Johanna Esdohr appeared in the 1900 U. S. Census, age 58, as a housekeeper (possibly servant) in Brooklyn. Her information indicated she immigrated in 1865.